Product FAQ for Shopify is a wonderful application which enables you to add FAQs for products as well as general faqs for your store. You can add a dynamic different FAQ for each product. You can customize the color and width of FAQ block from the backend. The FAQ will be displayed on the Product description page in jquery accordion style. With the help of this app, Admins can add related FAQ (Frequently Asked Questions) to the products & his shop. A FAQ is a set of tentative questions which may arise in the mind of buyers about the product. Hence FAQ increases the sales as now buyers have most of their doubts sorted in the form of FAQ pre & post purchase of the product. Admin can add FAQ with each product as well as for his store. Product FAQ is having Ajax Accordion user interface. Admin can customize color, the width of FAQ block from the backend. 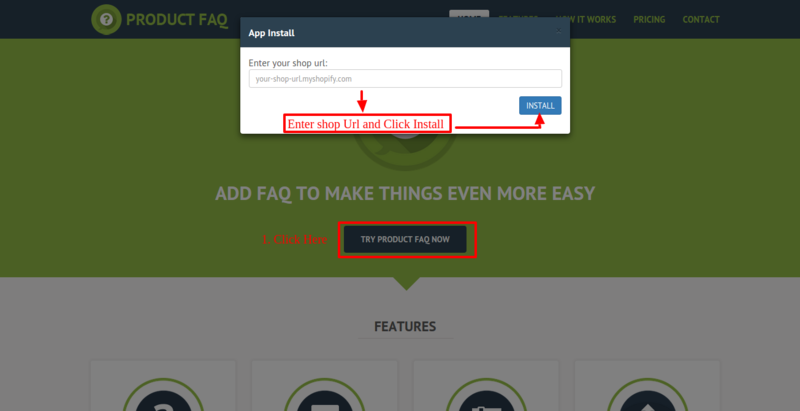 On Landing Page, click on ‘Try Product Faq Now’ & you will find the “install” button. Enter the shop URL where you want to install the app. Go to the Shopify store backend and add or edit any product as per your requirement. Now click on the Product FAQ in the “More Action” menu. After clicking on product FAQ you will get redirected to this page as shown in below screenshot. Add a FAQ for the product. In this way, you can add a FAQ on any product added on your Shopify store. How to add a general FAQ? Admin can add General FAQ i.e. frequently asked questions about his store. This will clear his customers’ doubt and thus help him increase sales rate. Go to your Shopify backend >> Apps Section >> Open the Product FAQ app. Now, when you’ll click on the General FAQ button, you’ll have a page with previously added FAQs which you can update/edit/enable/disable. Enter the following details: FAQ Sequence, FAQ Title & FAQ Description. The following FAQ will be added to the General FAQ page from where you can edit/delete/enable/disable it. The admin can display the store FAQ on the frontend by adding navigation for his Store FAQ. Shopify Backend >> Online Store >> Navigation >> You can choose where you want the FAQ navigation to be i.e. Footer or Header of the page >> For the header, click on the ‘main menu’ option >> Add New Menu >> Name your navigation & as a link search for Store FAQ in pages >> Save. You have to follow this step only once after installation of productFAQ after that you can just simply add any FAQ without following this step. Go to the Shopify store backend and click on the Themes tab. After clicking on the Themes tab launchpad page will appear. Click on product.liquid menu and paste the code given in the next step. Set the configuration for your FAQ. NOTE: You can also refer the blog here http://webkul.com/blog/add-jquery-accordion-faq-shopify/ for adding accordion style FAQ on the site. If you have any issue, do write to us we will try and get your issue resolved as soon as possible.